“All of our volunteers who participate in our reenactments know that we want everything to be time period accurate, so wristwatches do not fit the fashions,” Hodson said. Now in the 11th year, the Aukki River Festival Aug. 25-26 attracts hundreds of families and guests from throughout the Midwest eager to step back into time for a weekend. 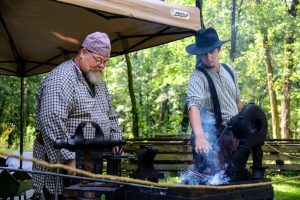 More than 30 historical accurate encampments populate the banks of the Kankakee River along Baums Bridge Road in Kouts allowing a glimpse at community life spanning the mid-1700s to the 1930s. “The Collier’s Lodge and General Store are a landmark anchor along this stretch of the Kankakee River and we know the store’s gas station opened in the mid-1930s, so that’s the time period we decided to use as our cap for the Saturday and Sunday recreation,” said Hodson, who is also president of the Kankakee Valley Historical Society. Musical entertainment from the period, crafts and period appropriate food are featured each year. Buffalo burgers, corn fritters, pumpkin scones and sassafras tea are some of the most popular menu items sold. “We abide by strict guidelines for all of the vendors for what is sold and displayed, mostly homemade goods,” Hodson said. 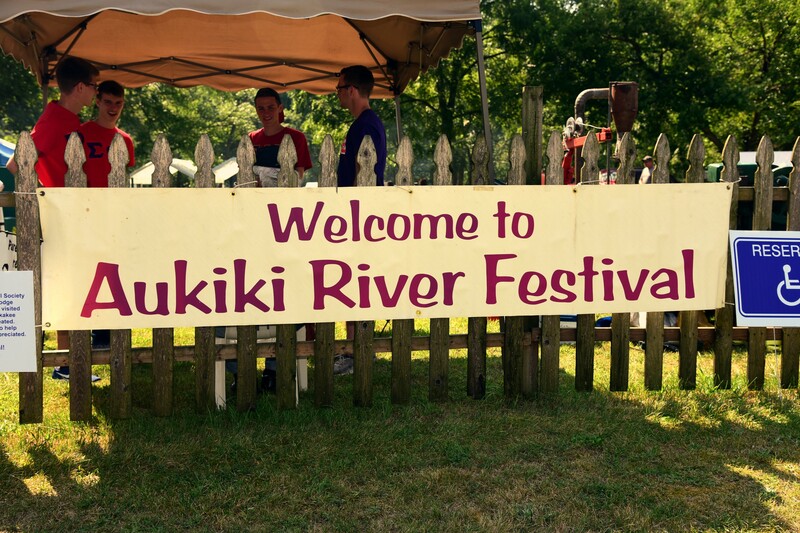 The festival’s name “Aukiki” is the Potawatomi term for Kankakee and was common as the identifying tag used for the Kankakee River in the early settlement days. Hodson said the weekend is filled with fun and amusement, but also serves a key purpose to educate about the Kankakee River’s vital impact on the early economy and socialization for Indiana’s early days. He said the encampment guests who will visit during the weekend represent fur trappers, French-Colonial settlers and even Civil War nods. “Any water source such as the Kankakee was a vital theme for transportation, commerce and attracting a population,” Hodson said. He said the biggest impact and transition for the river during the decades came at the turn of the century when government agencies decided to drain the Kankakee Marsh, which were natural wetlands terrain along the river, resulting in more than 500,000 acres of marshes and swamps drained along the 250-mile river. Hodson said the intent was to create more farming land but the change in the landscape and ecology was soon recognized as a mistake. Today, the Collier Lodge is the final structure still standing from the Sportsmen Era, the years spanning from 1880-1910, and a time when even President Theodore Roosevelt journeyed to hunt and fish along the Hoosier river. Hodson purchased the lodge property in 2000 after discovering it in a state of disrepair. A decade later, he decided a festival event would help draw visitors to recall the former “glory days” of the Kankakee River as a famed destination. Each year, new events are added such as free archery lessons for children and a historical fashion show. “Another new feature we have this year is a native garden which has the types of vegetable staples that homesteads of this time in Indiana history would have depended on for menus,” Hodson said. Even though Hodson and his festival organizers work hard to police modern out-of-place technology and accessories from infiltrating the weekend showcase events and activities, guests are invited to take photos and utilize today’s trends for communication devices. “We do allow our volunteers to have some required modern luxuries, such as coolers to keep water and snacks available since these are long days and the period costumes are heavy and layered,” Hodson said. KOUTS — A new garden with native plants is among the new features at this year’s Aukiki River Festival. The 11th annual festival, at the site of Collier Lodge, 1097 Baum’s Bridge Road at the Kankakee River, is Aug. 25-26. The festival’s aim is to show what life used to be like along the river. Kankakee Valley Historical Society members planted the garden this spring and plan to maintain it in future years, historical society founder John Hodson said. Tim Jordon, aka Healing Spirit, will be at the festival to explain the native garden and Native American culture. Jordon is Shawnee and Lenape and speaks Shawnee. 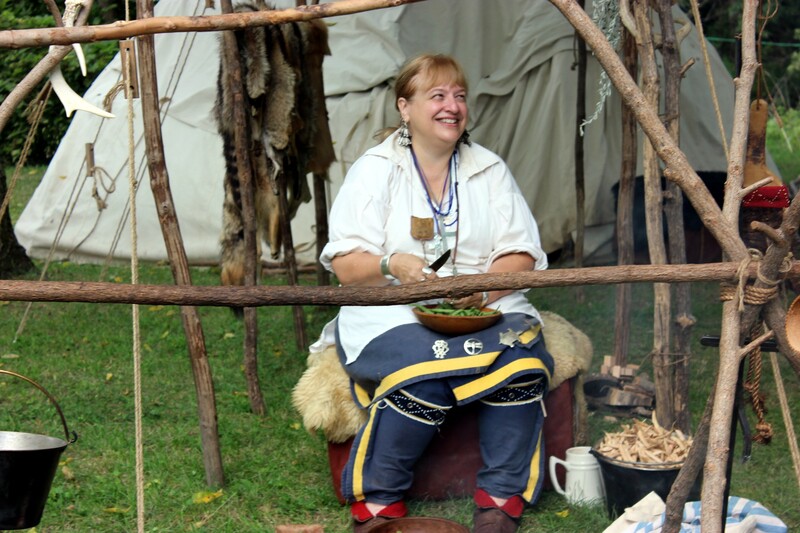 He will demonstrate primitive fire marking with a bow and drill, as well as arrowhead making and sewing cattail mats for his wigwam. He also will discuss native gardens and seeds. Another new participant this year is the Wildlife Educational Exhibit of Northwest Indiana, Hodson said. Wildlife of the Kankakee River area will be on display. On hand to answer questions will be Timothy Ferguson, a disabled Army veteran, his wife, Cheryl, and Air Force veteran Paul Zarowny. 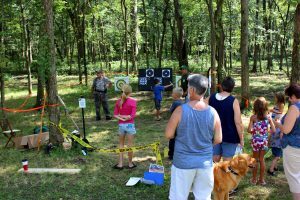 The Izaak Walton League of America Mobile Archery Clinic will return to the Aukiki River Festival. 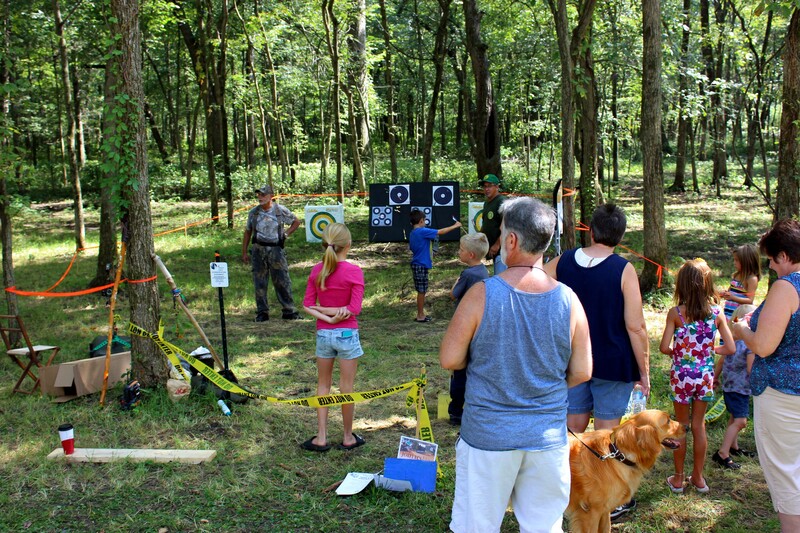 The clinics introduce young boys and girls (especially ages 5 to 14) to the sport of archery and promote youth outdoors and youth recreation. All equipment is provided by the MAC Wagon. Blacksmith Seth Nichols will show how he makes products and sell what he has made. Nichols also takes special orders. The Fort Tassinong Muzzleloaders has participated in the Aukiki River Festival since 2007, when the festival began. The group’s black powder muzzle loading demonstration has been a big hit.